The Guyana Fire Service’s auxiliary unit deployed to Bon Fim, Brazil. 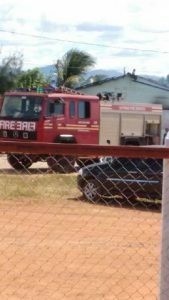 Guyanese fire fighters in Lethem on Wednesday went into action in northern Brazil, extinguishing a blaze and preventing it from spreading to neighbouring buildings. “The auxiliary in Lethem received a call for help from the Bon Fim area because there is no fire service there,” Fire Chief, Marlon Gentle told Demerara Waves Online News. He said one building was damaged and five others were saved by the Guyanese fire fighters. There were no reports of injuries in that fire that began at about 11:45 AM (Guyana Time). He said investigators have so far found out that the fire stemmed from a domestic dispute. 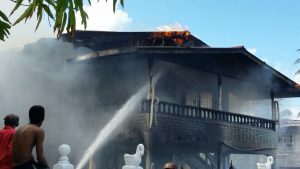 The scene of the fire was located about 10 minutes drive from Guyana across the bridge that links the two neighbouring countries. Meanwhile, fire fighters in Berbice were unable to save a house at Canefield, East Canje, resulting in the dislocation of several occupants. Businessman and block-maker, Garfield Fyffe recently bought and renovated the house. It was occupied by his mother and several of his siblings. That fire began at about 11 AM. The badly damaged hiuse at 331 Canefield, East Canje, Berbice.